The other day, I was having a discussion with a friend about how there seems to be a growing divergence between the movies that most Americans see and those that the Academy honors with a Best Picture (or, really, any) nomination. It’s certainly true that, for as long as I have been paying attention, the Best Picture nominees in a given year have not typically been among that year’s top-grossing films. But I was curious the extent to which this is a new phenomenon. Hence, the following figure. I’ve gone through the top ten–performing films at U.S. box offices in every year since the Academy Awards began—the first Oscars recognized films released in 1927 and 1928—and I’ve marked which of those films received Best Picture nominations. For most of the history of the Oscars, there were five Best Picture nominees per year (actually, for the first Academy Awards, there were only three), but for twelve years in the ’30s and ’40s, as well as for the past six years, there’ve been closer to ten (though the exact number has varied). I thought it best to differentiate between years in which there were only five nominees (marked in red) and those where there were more (marked in yellow). I’ve also denoted with an “X” the films that went on to win Best Picture. In 7 of the 11 years since 2003, there have been no Best Picture nominees among the top ten–grossing films. This happened only twice in the 76 years prior. No Best Picture winner has been in the top ten since The Lord of the Rings: The Return of the King in 2003. Since 1990, the Best Picture winner has been absent from the top ten 17 times. Before 1990, it had happened only 11 times. The only Best Picture nominee in the top ten this year is American Sniper, and of all eight nominated films, that one received the lowest score (73 percent) on Rotten Tomatoes. The next most popular Best Picture nominee this year is The Imitation Game, the 41st highest-grossing film of 2014 at U.S. box offices (as of writing). The main takeaway point from this figure, though, is that the separation between Oscar-worthy movies and very popular movies seemed to start about three decades ago. As recently as the 1970s, it was not uncommon to have three or even four of the Best Picture nominees among the year’s top ten–grossing films. We see the color in this figure start thinning out in the 1980s, and by the mid-2000s, there are five consecutive years where none of the Best Picture nominees is in the top ten. Indeed, after 2003, it was not until the Academy raised the allowed number of nominees to ten, in 2009, that a top ten–grossing film again earned a Best Picture nomination. Obviously, a lot’s changed in the motion-picture industry since the ’70s, and really getting to the bottom of this trend is probably a complicated ordeal. Most of this shift is likely explained by the increase in the sheer volume of films that have been released in more-recent years—especially superhero flicks and other major franchise movies—but there’s probably lots of other stuff going on, too. Either way, I’m less interested in how 2014’s Best Picture nominees are faring relative to 2014’s box-office hits and more interested in how 2014’s Best Picture nominees are faring relative to, say, 1970’s Best Picture nominees. That is to say, it’s possible that we’ve seen an influx of superhero and franchise box-office juggernauts, but that the actual share of the population that sees the Best Picture–caliber films from year to year is relatively constant—or even increasing. Maybe the movies in general have just become more popular in recent decades, so that, even though the Best Picture films are not typically the most popular in a given year, they are still just as widely consumed now as they were 30 or 40 years ago. This train of thought led to the following set of images. 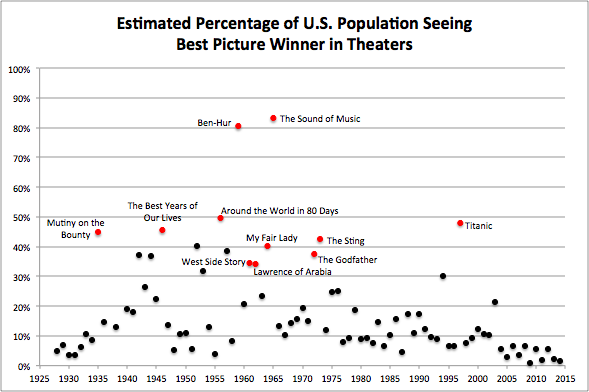 I wanted to answer the question: What’s happened over time to the share of the U.S. population that actually sees the Oscar nominees for Best Picture? This proved to be a time-consuming inquiry, so I only examined the Best Picture winners. To estimate the share of the U.S. population that watched a given film in theaters, I took the U.S. box-office gross for the film and divided that by the average cost of a movie ticket in the year the film was released. This gives an estimate for the number of U.S. tickets sold for that film, which is a decent proxy for the number of Americans who saw that film in theaters. (Obviously, this ignores things like people seeing a movie multiple times, or non-U.S. residents watching movies in the United States, but we’ll call it close enough for this exercise.) Finally, I divided the number of Americans who watched a given film by the U.S. population in the year the film was released to get an estimate of the percentage of the population that saw the movie. Turns out Gone with the Wind ruins everything. This graph would suggest that the average American saw the film 6.6 times when it came out in 1939—which, obviously, seems ridiculous. I spent a fair amount of time trying to figure this one out, and I think what’s going on is that Gone with the Wind’s initial release lasted four years, and it was re-released eight times. 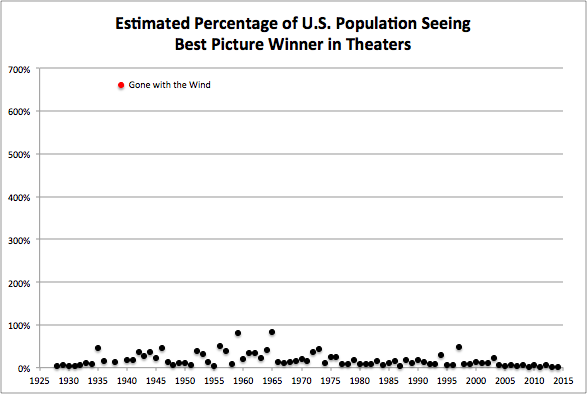 All of the U.S. tickets sales from those releases—which are spread out over five decades—are included in its domestic gross total, and this makes this calculation a bit nonsensical for Gone with the Wind. So let’s go ahead and take it out and zoom in on all the data points below. Things are looking a little cleaner. Still, there are a few outliers, most notably, The Sound of Music and Ben-Hur, which, according to this calculation, more than 80 percent of the country saw. The left side of this graph is also fairly noisy, and less relevant to what’s been going on over the last few decades of American movie history, so let’s just look at 1960 onward and zoom in further to where the vast majority of the dots are clustered. Now the trend is pretty clear. In 9 of the last 11 years, less than 6 percent of the U.S. population watched the Best Picture winner. During the entire period going back to 1960, this happened only once prior, The Last Emperor in 1987. If Birdman or Boyhood wins tonight—which, according to FiveThirtyEight, is overwhelmingly likely—either of those films would be the second least-watched Oscar winner ever, after The Hurt Locker in 2009. This quickly became more quantitatively involved than I intended when I set out to write this piece, but after following this analysis to something of a conclusion, I think two things are clear. Yes, the movies that are most likely to be consumed by Americans are becoming increasingly less likely to earn Oscar nominations. 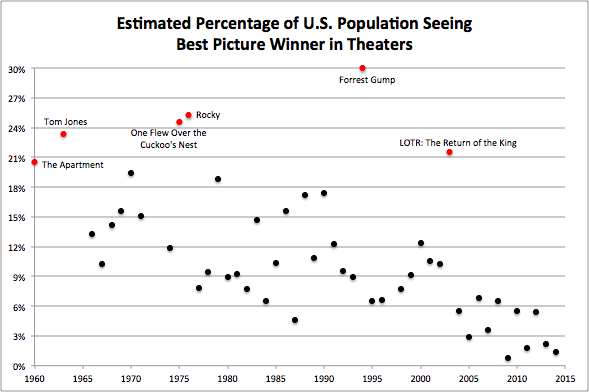 And, yes, a shrinking percentage of the American population is watching the supposedly best American movies. Finally, I’ll deliver on the promise of my title: a discussion of why the Oscars matter—today more than ever. And, from here on out, it will be short(ish). In many ways, the Oscars are a self-congratulatory exercise in frivolity where very rich and famous people get together to either pick up awards and make speeches or pretend to look thrilled when other people are chosen to pick up awards and make speeches. And we gossip about those very rich and famous people and talk about what they’re wearing and speculate on what they’re saying to the very rich and famous people they’re sitting next to. That’s the ceremonial side of the Oscars, and though I enjoy it as much as the next person, we could all probably do without it. But there’s another side—a much more important one—to the Oscars that probably doesn’t receive the credit it deserves. The Academy Awards are an institution that, every year, suggests five to ten films for Americans to go see and think about and discuss. And there is an inherent value, I believe, in lots of people in our society all grappling together with the same questions. I thought American Sniper lacked a basic self-awareness of the jingoism that pervaded the movie, but other people I’ve talked to said they saw it as being squarely anti-war. I thought the portrayal of LBJ in Selma was one of a reluctant ally who eventually finds himself on the right side of history, but many others saw him as being more antagonistic toward the Civil Rights Movement. I think it’s good that the Oscars spur these sorts of discussions. The quantitative analysis in this post—which, although not something that I’d want to submit to the editors of the American Economic Review, is nonetheless fairly straightforward—confirms my suspicion that started this line of inquiry: that the best American films today are not being watched by as many people as their counterparts several decades ago. If not for the Academy Awards, I suspect this trend would be even more exacerbated. The amount of media—film, television, random things on the Internet—that one has the ability to consume is increasing every day. And the number of hours in each day remains stubbornly constant. If Birdman or Whiplash hadn’t received Oscar nominations, I think it’s unlikely I’d have gone to see them. It’s not because I don’t enjoy good movies; it’s just that I have a surplus of content available to me, and I probably wouldn’t have had the cause to seek them out. I know of many people who operate similarly, who every year make a point of seeing the Best Picture nominees specifically because they are Best Picture nominees. And with this growing importance of the Oscars, it’s all the more reason why we should be concerned how disproportionately white and male the Academy is. And finally, all this is to say nothing of the question: With the shrinking financial incentives for studios to make high-quality movies that appeal to critics, if it were not for the Oscars and other award programs that trade in Hollywood’s economy of prestige, would studios even want to continue making such movies? SOURCES: U.S. film grosses from http://www.boxofficemojo.com for the years 1980 through 2014 and from http://www.the-numbers.com and Wikipedia for years prior to 1980; average ticket prices from http://www.boxofficemojo.com; U.S. population data from the U.S. Census Bureau.